Motorists call police about man demanding a ride in Vero Beach. 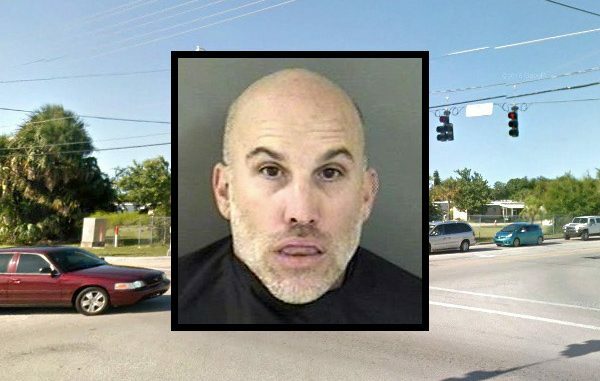 VERO BEACH – A Vero Beach man was arrested after several people complained to the Indian River County Sheriff’s Office that he was jumping in front of moving vehicles and yelling that he wanted a ride. Mark Haryslak, 47, told deputies that he had five beers at a bar on 8th Street and was walking home. Haryslak was then asked if he could call someone to pick him up, but he said “no” and was uncooperative. As deputies spoke to Haryslak, an individual drove by and stated the suspect was the man seen “jumping into traffic and ordering people to stop and give him a ride,” according to the report. Another witness, who was identified as a retired federal law enforcement officer, stopped at the location and advised he also saw Haryslak jumping in front of vehicles and yelling at people as they drove by. A third witness said she was attempting to make a turn and was concerned that Haryslak was close enough to make entry to her vehicle. She steered away and saw Haryslak acting erratically towards another approaching vehicle. Haryslak was arrested and transported to the Indian River County Jail where he was charged with disorderly intoxication. This is the same suspect who was arrested in November for prank calling 911 from Riverside Cafe in Vero Beach.